My headshield was starting to get very rusty and looking very untidy so I decided to get a new manifold headhield and paint it with High Temperate Paint, so it will give it longer life. And this is an HOWTO on removing and replacing the manifold headhield. I use Cellulose Thinners to get rid of dirt & grime on the headshield. Leave to dry. Then I use Very High Temperature Engine Enamel Paint to cover up the headshield. After painting, leave it to dry - should take about 2 hours or so. I gave it three coats for best results. While leaving the headshield to dry, I jacked up my car. Observe and follow the safe jacking rule. This is needed as you have to drop the fan framework in order to access the headshield. Photo shows where to put the axle stand. This shows front, left side. This is to show you where the axle stands are. Now, get under the car. On the driver side of the engine, near the front, you should see this. Remove the metal clip. This is what the clip looks like after removing. Once removed, unplug it. 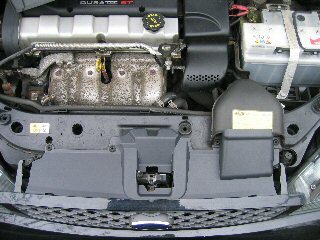 Now get yourself under the car again and carefully remove the fan framework, taking care of other hose pipe and wiring. NOTE! There is one wire attached to the fan framework that you may want to unclip for easy removal. But if you are careful, you can remove it without unclipping the wire. Here's what it looks like when it's out. Check the new manifold headshield is dried before fitting it the same direction as you took out the old one, start from bottom and push it upward. Fit it, screw them down and reconnect all cables (use this guide in reverse order). There WILL be some scratches on the new manifold headshield but not much. Just apply some more paint on them.